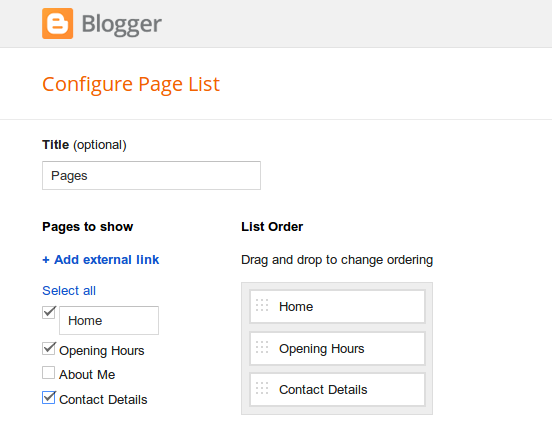 Managing the Pages Widgets for your blog is now done through the Layout UI. Multiple Pages Widgets can be added, if you want different pages linked to from different areas of the layout. To add a link to a URL which is not one of your pages, when editing or adding the Pages Widget, click '+ Add external link' at the top of the 'Pages to Show' list. 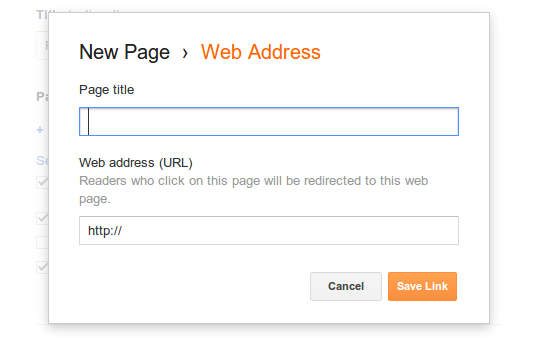 This will show a dialog where you can set the title and URL to add to the list. Adding pages to your blog can be a great way to organize content - like ‘About me’ or ‘Advertise’ sections. To make managing pages easier, we redesigned the ‘Pages’ tab in the Blogger dashboard to make it look and feel more like something you’re already familiar with: managing posts.